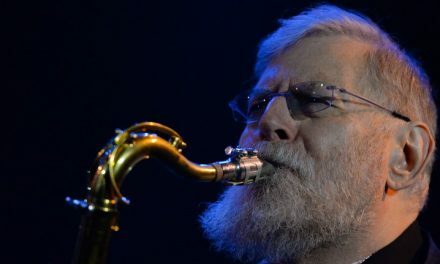 Tenor-saxophonist and flutist Lew Tabackin was born on March 26, 1940 in Philadelphia, Pennsylvania. Tabackin began on the flute when he was 12, adding the tenor three years later. He studied flute at the Philadelphia Conservatory of Music (graduating in 1962) and, after serving in the Army, he worked with Tal Farlow, Chuck Israels and a group with Elvin Jones. Tabackin made his recording debut with Maynard Ferguson’s orchestra in 1967, also recording during that period with the Duke Pearson big band and the Jazz Composer’s Orchestra. He developed a large tone on tenor that was inspired by Sonny Rollins, Coleman Hawkins and Ben Webster while on flute Tabackin is most influenced by classical players and the music of Japan and Asia. He met pianist Toshiko Akiyoshi in 1967, first recorded with her the following year (for a quintet set that included Kenny Dorham) and they were married in 1969. 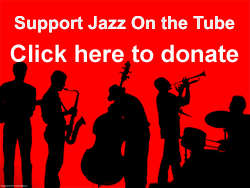 In 1972 when the Tonight Show (Tabackin was a member of the band) moved to Los Angeles, Tabackin and Akiyoshi also moved West; the following year they co-founding the Toshiko Akiyoshi-Lew Tabackin Big Band. The orchestra, featuring Akiyoshi’s arrangements with Tabackin the main soloist on tenor and flute, was quite successful in its performances and recordings. Tabackin continued a busy solo career, recording with Warne Marsh, Louie Bellson, Shelly Manne, Bill Berry, Phil Woods, and his own sessions. The couple moved back to New York in 1982 and reformed the orchestra (which was now simply called the Toshiko Akiyoshi Orchestra which stayed active for another 20 years. Lew Tabackin has continued playing in prime form up to the present time. Here is Tabackin playing a warm version of “My Ideal” at a Tokyo concert from 1988, accompanied by the Hank Jones Trio.